No reply came; the wind blowing sharply was the only sound. 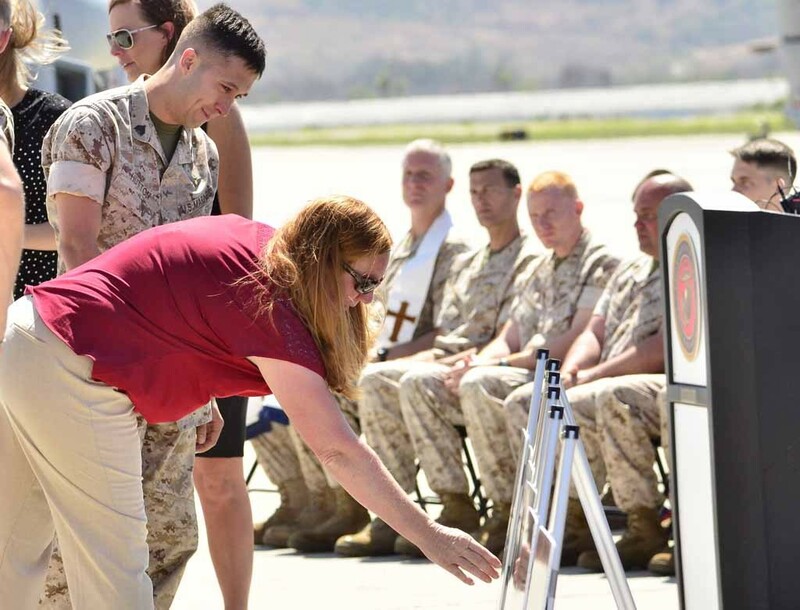 Families wept as their husbands, sons and brothers were no longer there to anwer the roll call Wednesday at Camp Pendleton. 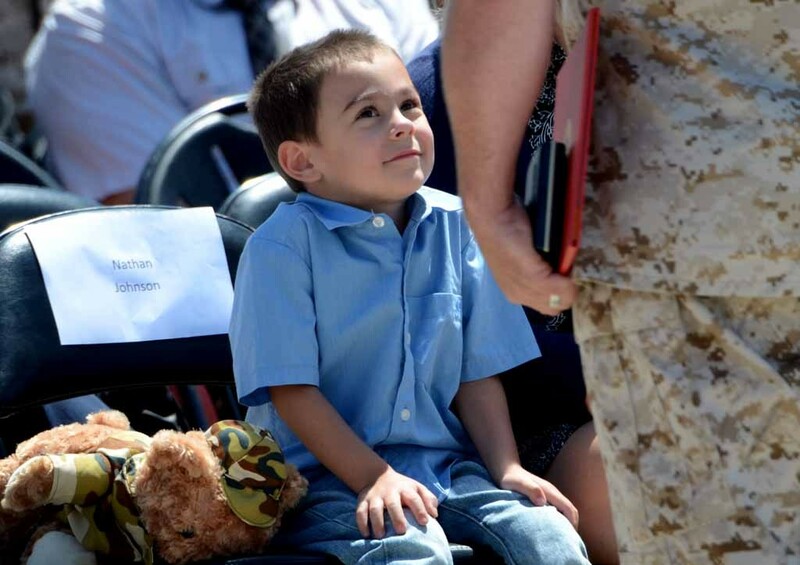 Seated in the front row, young Nathan Johnson clutched a stuffed Marine Teddy Bear. 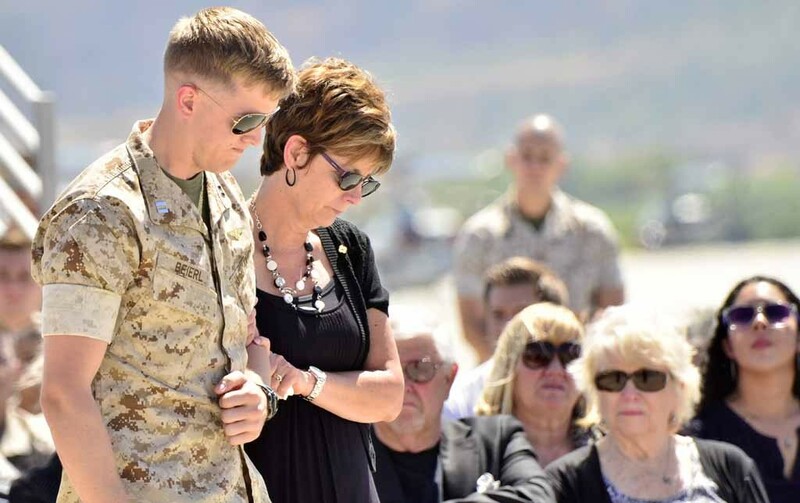 He and family members were among 700 Marines honoring his father, Sgt. Ward M. Johnson IV, and five others who died in a May 12 UH-1Y Huey helicopter crash during a Nepal rescue operation north of Charikot, Nepal. 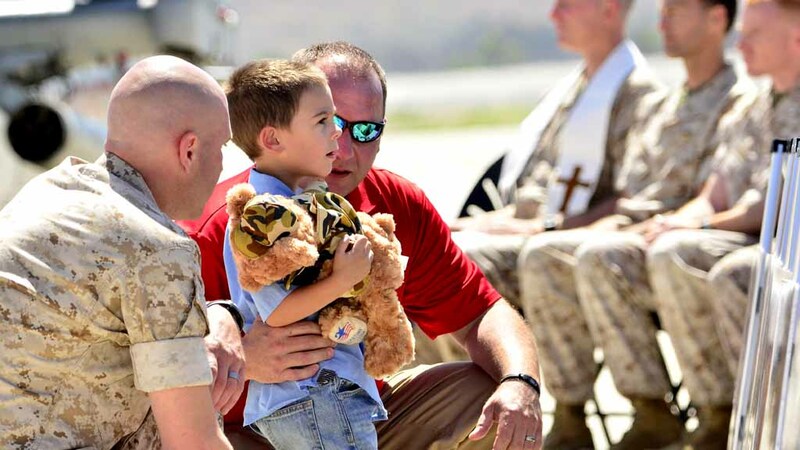 The Marines were delivering 3,000 pounds of relieve supplies and evacuating people after the earthquake and aftershocks that measured up to 6.3. 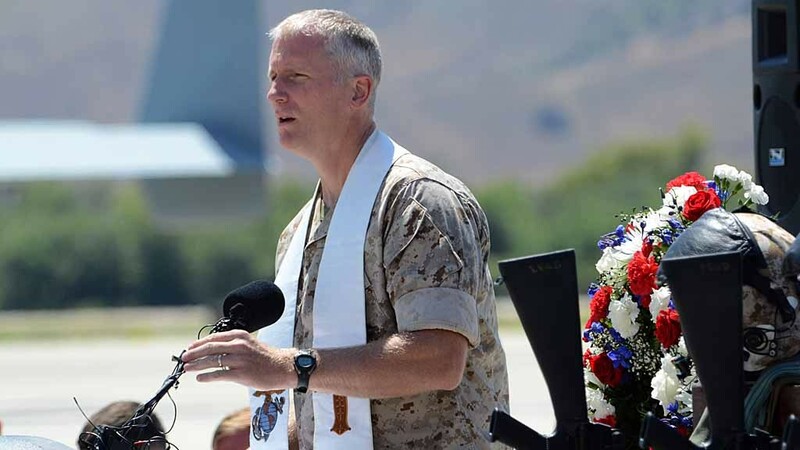 Scriptures were read by the chaplain and eulogies were given by fellow Marines, taking about the professionalism, dedication, selflessness and fearlessness of their fallen friends. Helicopters made a flyover during the ceremony. “Our Marines gave their lives so that others might live,” said Commanding Officer Lt. Col. Edward Powers. “They gave their lives so that the suffering of countless Napalis could be eased. 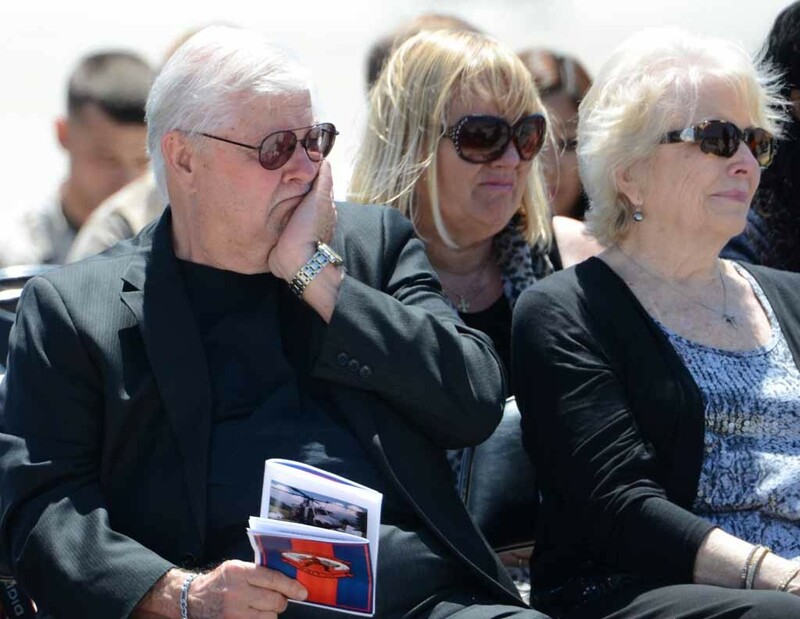 “I ask that you remember that our Marines died for a cause that was worth dying for in Napal,” Powers said. Capt. Dustin R. Lukasiewicz, 29, a native of Harlan, Nebraska. And Sgt. Eric M. Seaman, 30, a native of Riverside, California. The other two were Cpl. Sara A Medina of Kane, Illinois, 23, and Lance Cpl. Jacob Hug, 22, of Maricopa, Arizona. They were to have services elsewhere. Lukasiewicz was born in Nebraska and graduated from the University of Nebraska with a degree in Political Science. He was deployed to Afghanistan and Japan. He is survived by his wife, Ashley, his daughter, Isabelle, and his unborn son who is due in June. Norgren was born in Kansas and graduated with an aerospace engineering degree from Missouri University of Science and Technology in Rolla, Missouri. Norgren served in Afghanistan. He is survived by his father, Ronald, and his mother, Theresa, and sister, Jennifer. He was remembered as an “honest, inspirational, fearless, caring” person. Johnson was born in Florida. 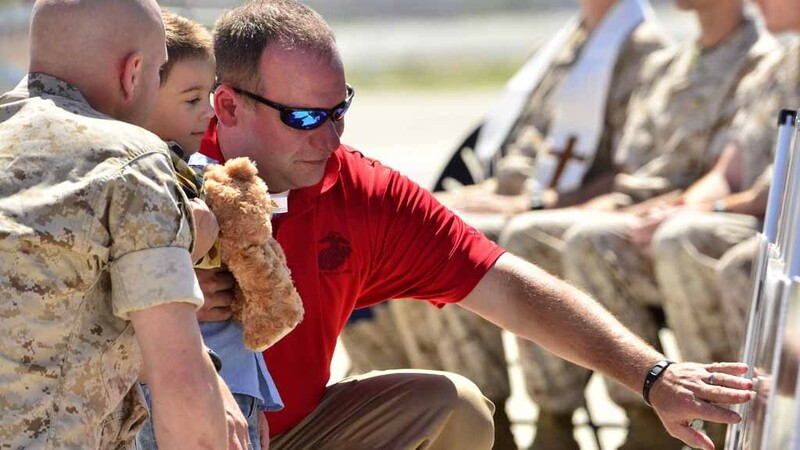 He completed a deployment to Afghanistan in support of Operation Enduring Freedom. 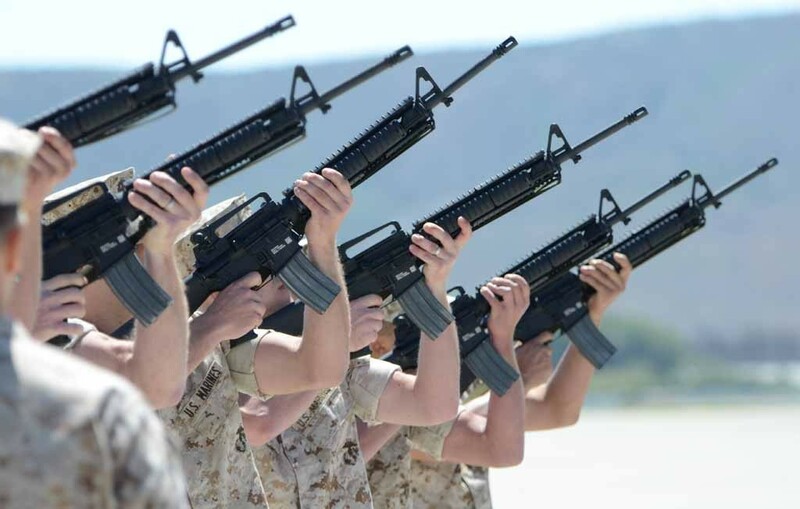 Johnson reported to Camp Pendleton and was assigned to Marine Light Attack Helicopter Squadron 469 “Vengeance. He is survived by his wife Haley, and his two sons, Nathan and Noah. Seaman was born in Wildomar, CA. He was deployed to Afghanistan and graduated from the Weapons and Tactics Crew Chief Instructor course and was deployed to Japan. He is survived by his wife, Samantha, his son, Roman, and his daughter, Ryleigh. 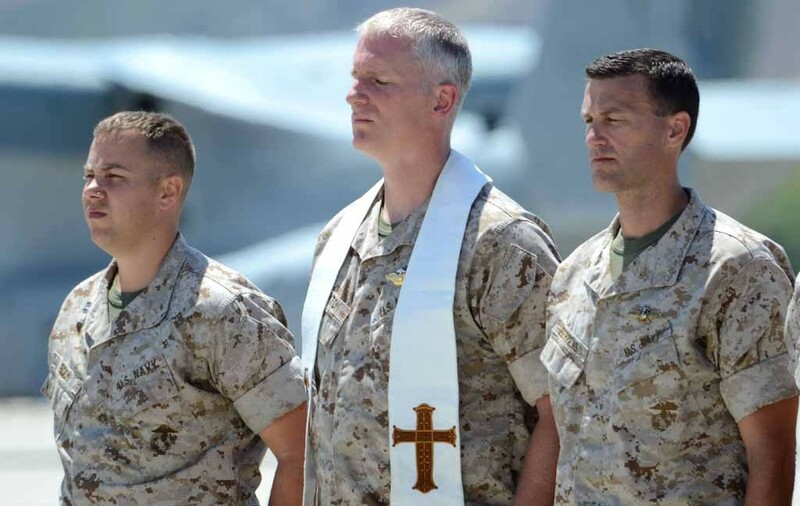 The ceremonies were hosted by Marine Light Attack Helicopter Squadron 469, 3rd Marine Aircraft Wing, on the flight line at Camp Pendleton. 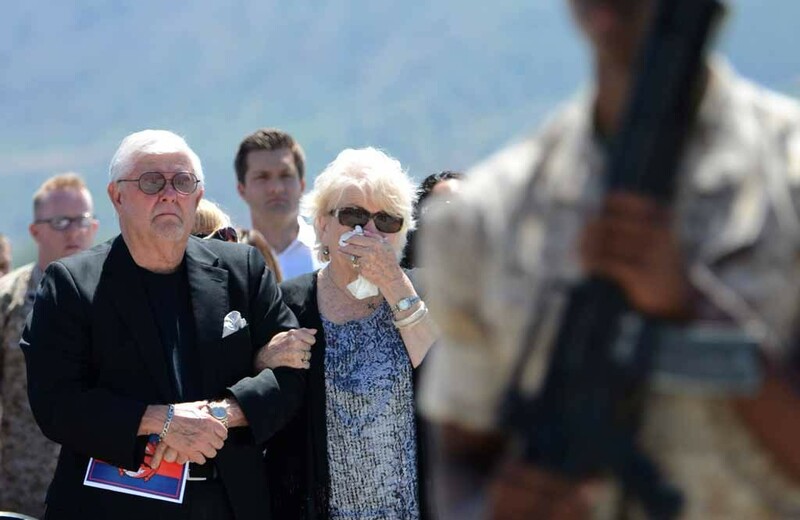 Family members grieve the loss of their fallen Marines. Young Nathan Johnson, whose father, Sgt. 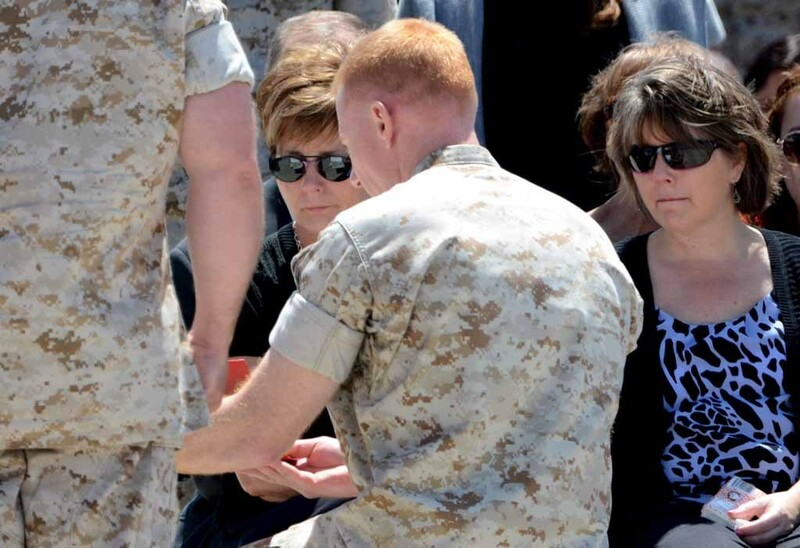 Ward M. Johnson IV, died in a helicopter crash in Nepal looks at the memorial at Camp Pendleton Wednesday. 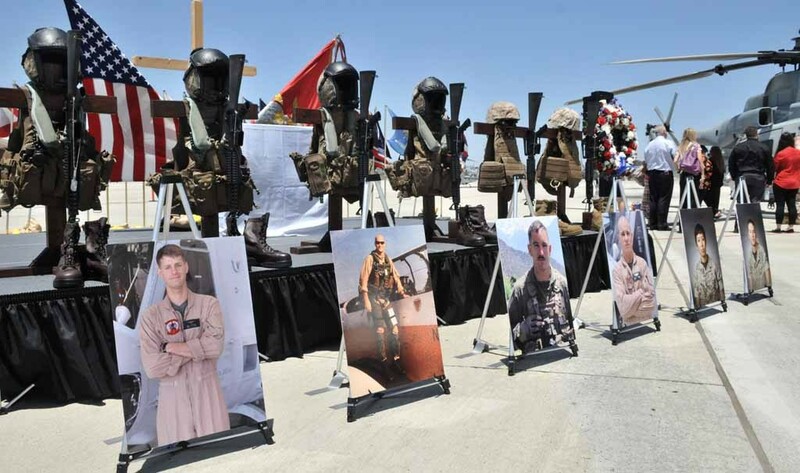 A memorial service was held at Camp Pendleton in honor of Capt. Dustin Lukasiewicz, Capt. Christopher Norgren, Sgt. Ward M. Johnson IV, and Sgt. Eric Seaman, whose helicopter crashed in Nepal. 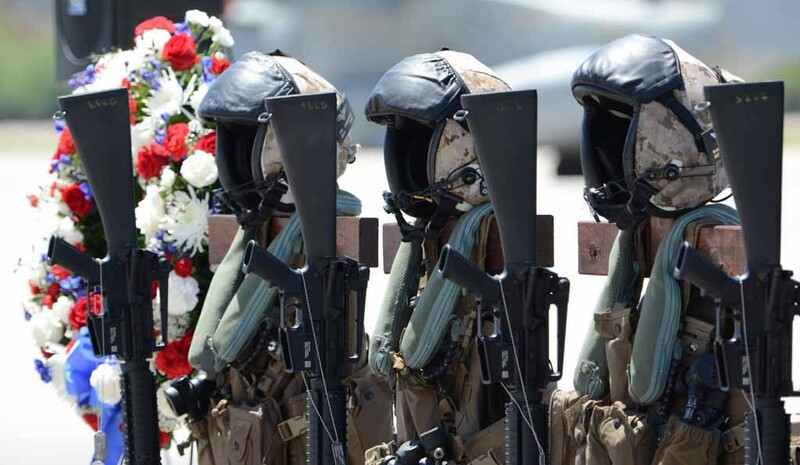 Marine comrades pay respects at the end of the memorial service. The helicopter was delivering earthquake relief supplies in Nepal. 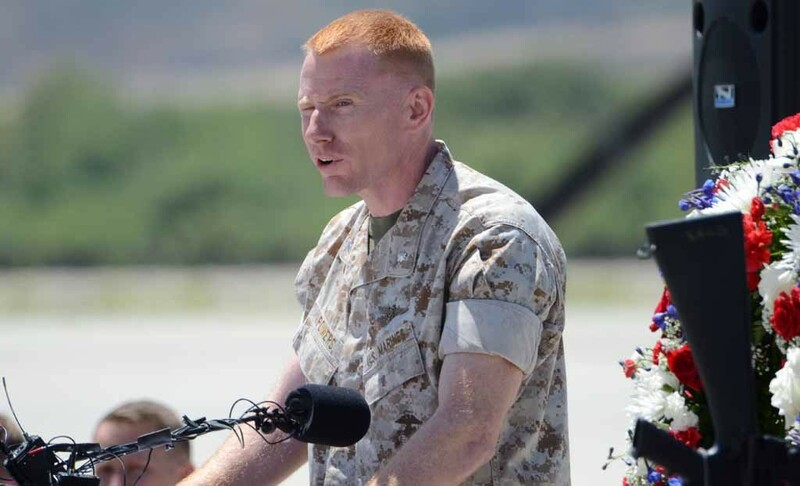 Commanding Officer Lt. Col. Edward Powers addresses grieving families and Marines. A member of another grieving family shows young Nathan Johnson his father’s photo. 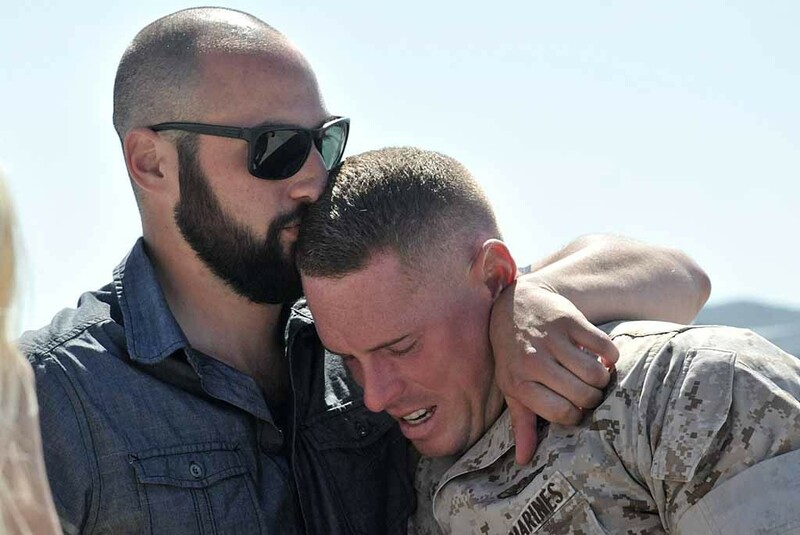 Nathan Johnson looks at a Marine who is about to give his mother a medal in honor of his father. Chaplain Drayton pause while taps are played. 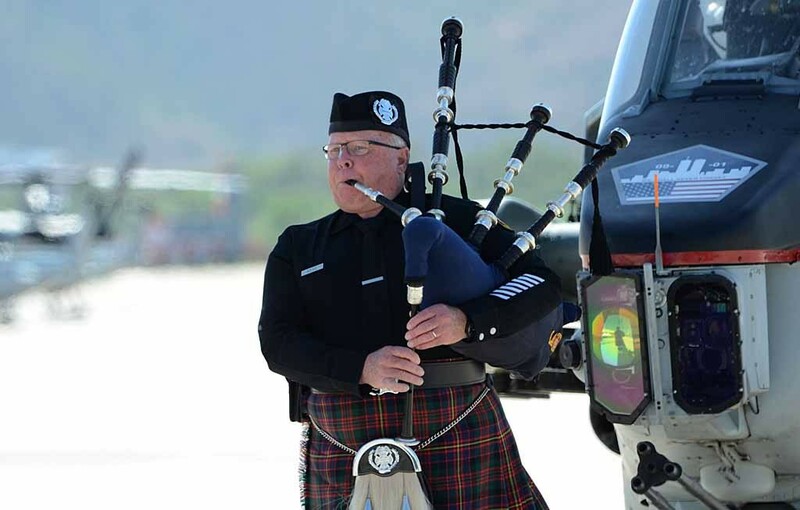 The Marine’s hymn was played on the bagpipes. 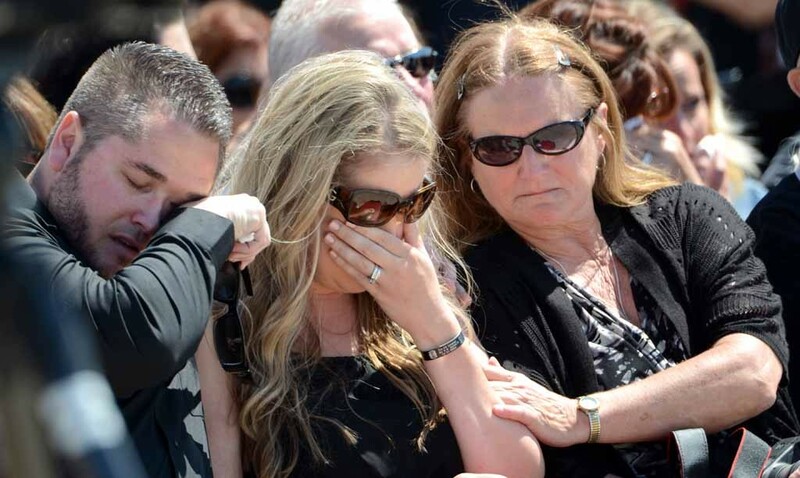 Family members cry as silence falls as their loved one’s name is called during the roll call. Eva Curtis touches her husband’s photo. 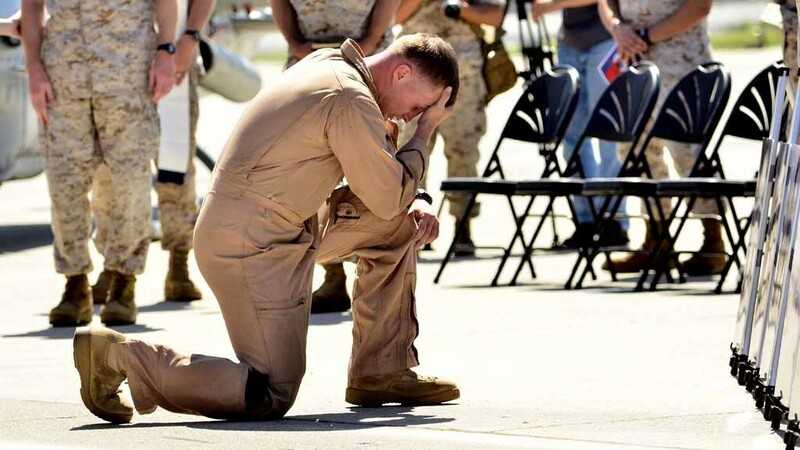 A Marine pauses to remember a fallen comrade. 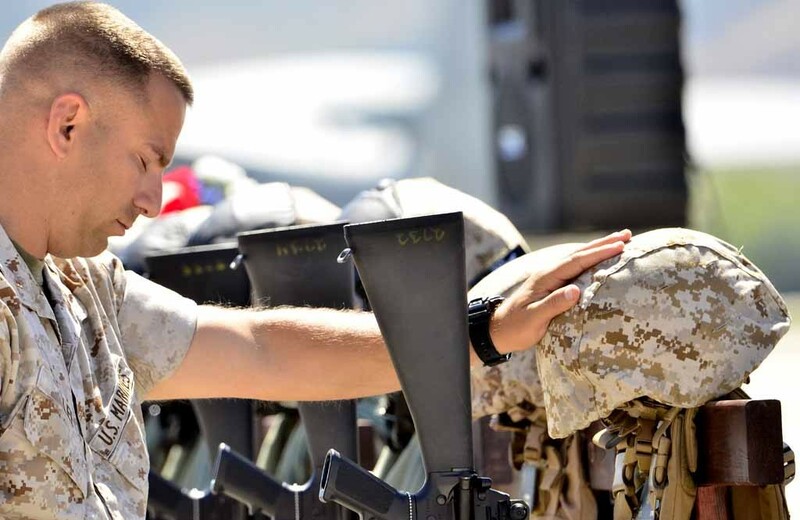 A Marine grieves at the memorial for fellow Marines. 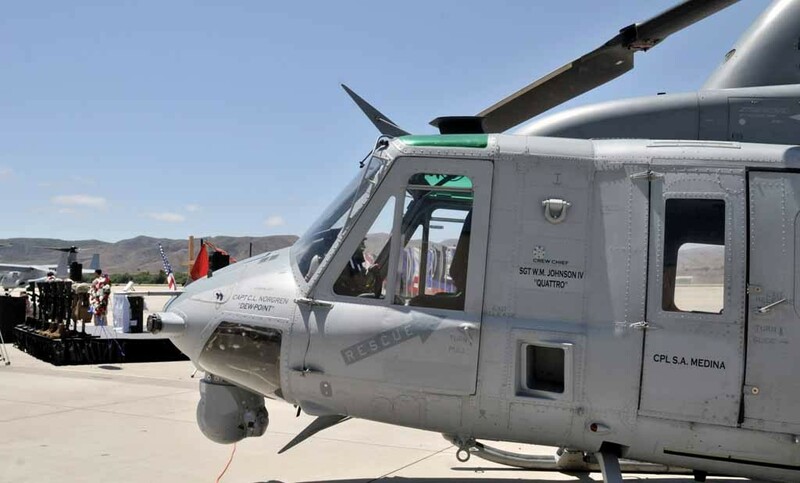 A Huey UH-1Y aircraft liked the copter that crashed in Nepal is displayed with names of the fallen members. 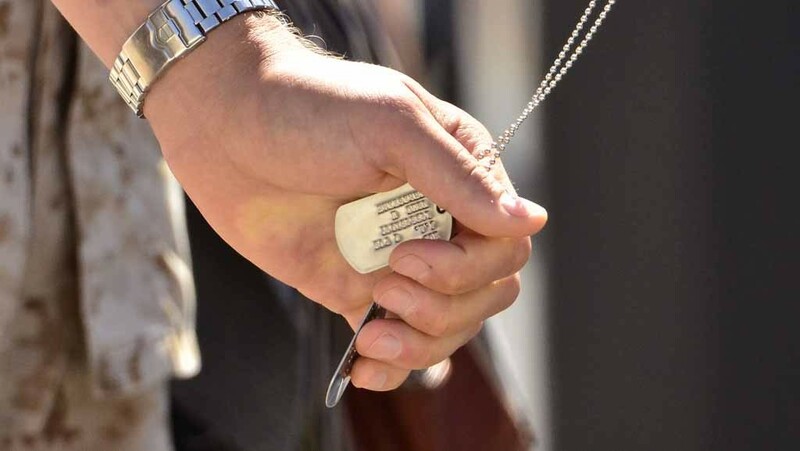 A Marine holds the dog tags of a fallen comrade. 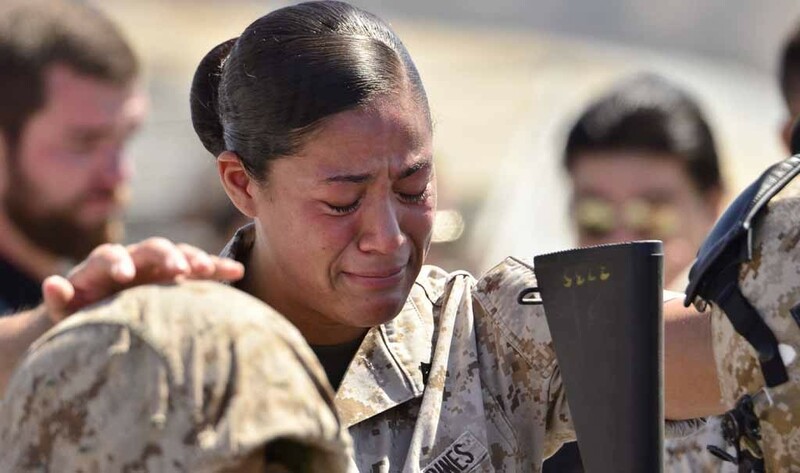 A widow of a fallen soldier weeps as she looks at her husband’s photo. Gear of the fallen soldiers was displayed at the ceremony. 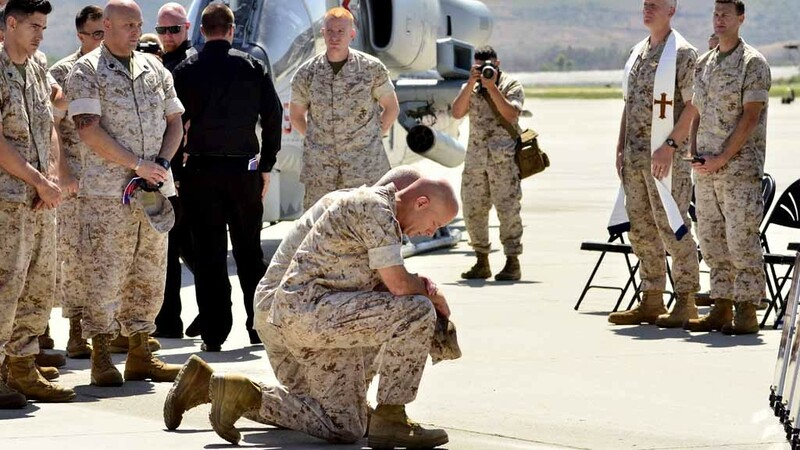 Lt. Gen. David H. Berger, and Sergeant Major Bradley Kasal kneel to pay honor to fallen Marines. 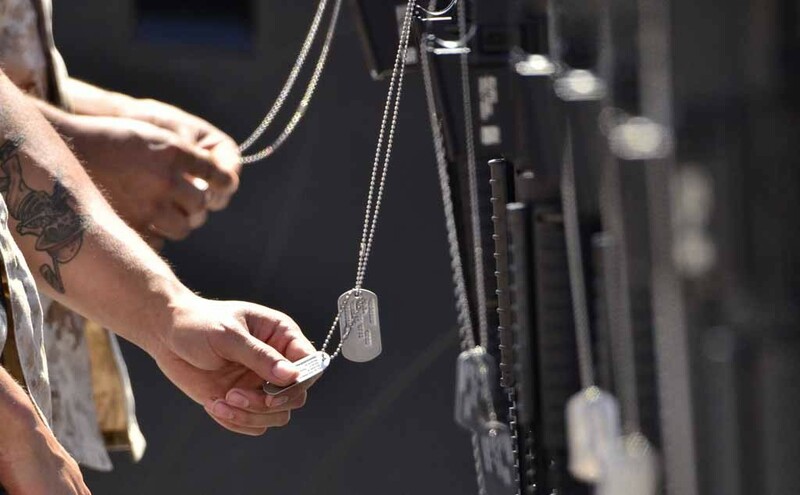 Marines cradle the dog tags of their fellow military members. 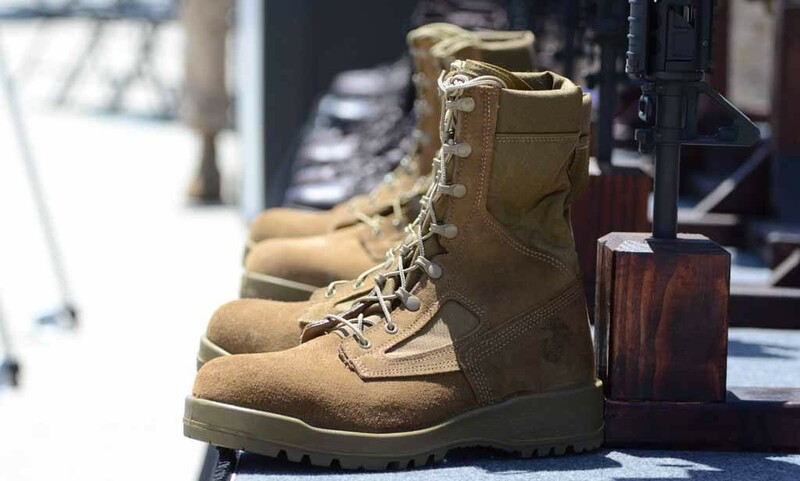 Helmets and boots of the fallen soldiers were laid out. 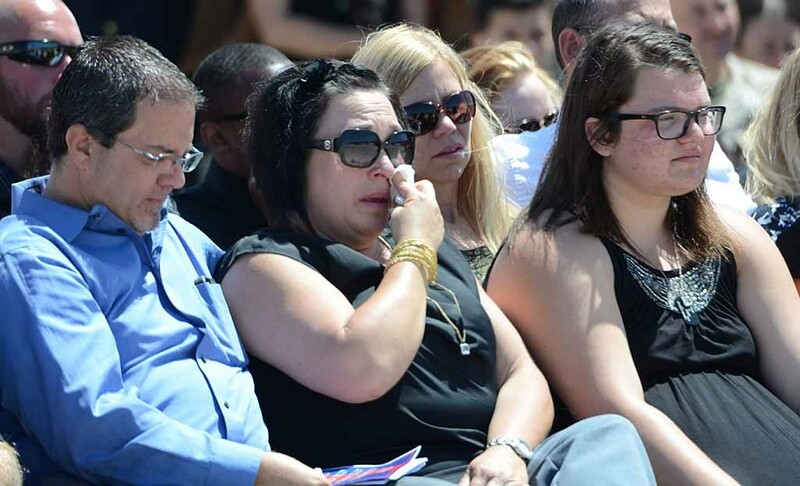 Family members listen to eulogies. 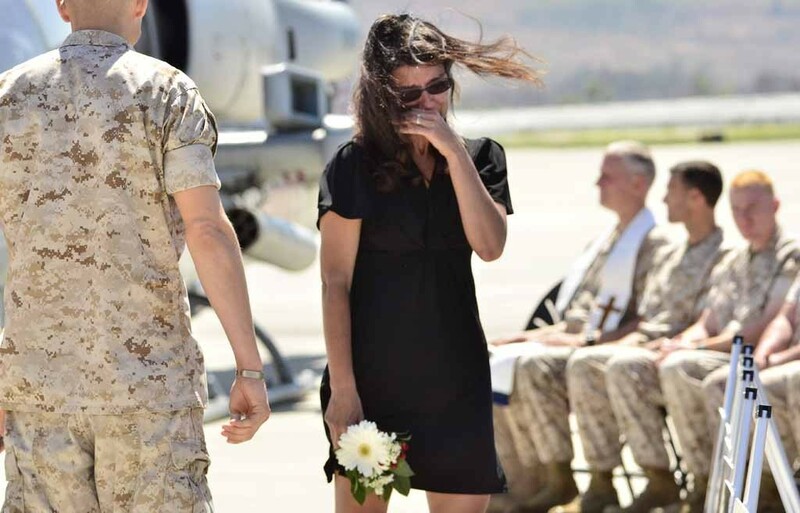 Cheryl Shepker is escorted by a Marine to the photos of love ones. 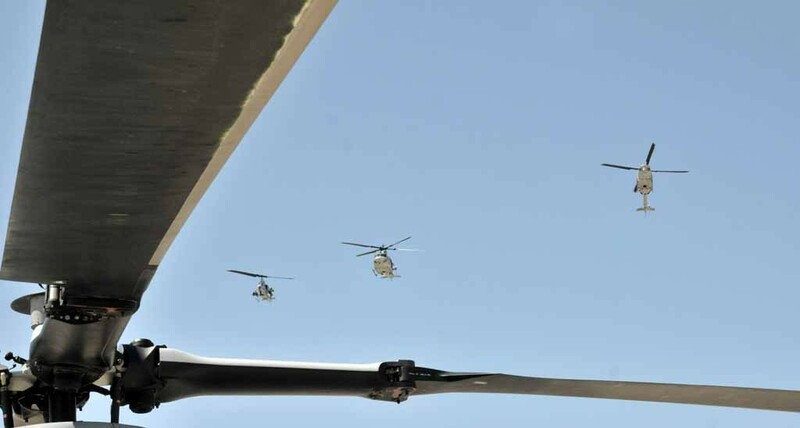 Helicopters conducted a flyover during the ceremony. Sgt. 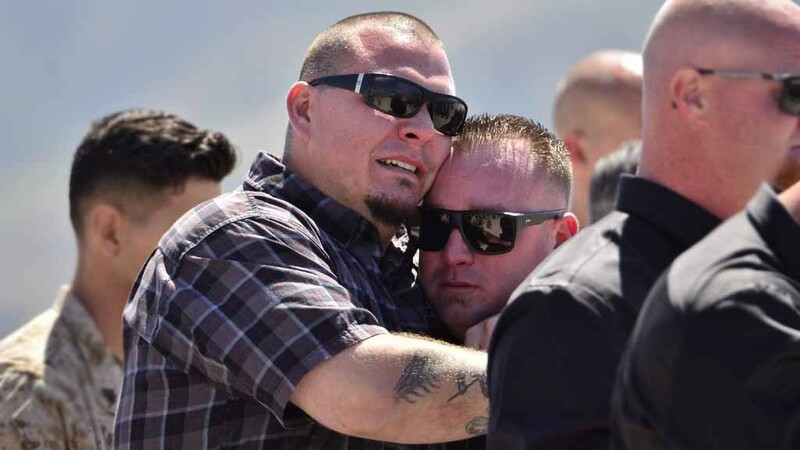 Hibler is comforted by a fellow mourner. 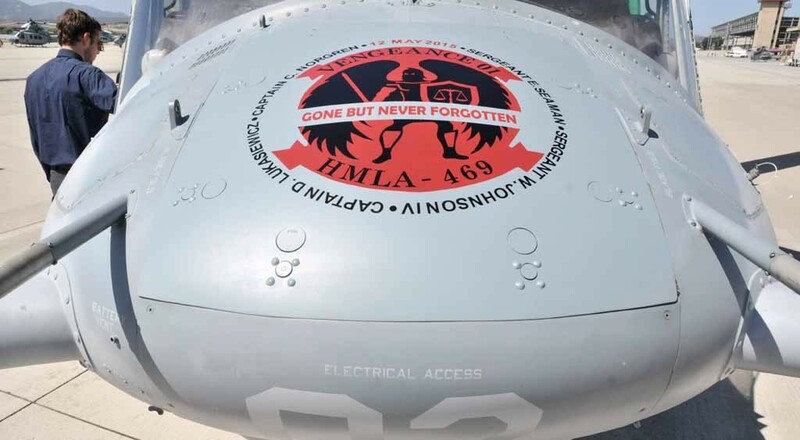 A Huey copter, like the one involved int the crash in Nepal is painted with names of the fallen. Cheryl Shepker is given a commendation and medal in honor of her husband’s service.